I loved the humour in Magicka, but I could never actually play it because of the magic system. I couldn't combine the spells fast enough to survive basically, so I ended up trying to win battles using only the one spell which didn't work out well at all. Still, good to see they're moving away from making a bazillion DLC and making a sequel instead. 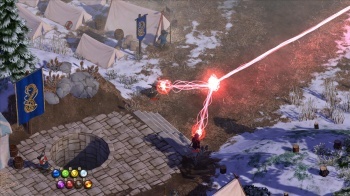 For people unfamiliar with Magicka, Tito forgot to mention that it's all about combining those elements; Fire and Earth, for example, will launch a flaming boulder at your target. Add more Fire and the resulting explosion will be bigger; add more Earth elements and the boulder you summon will be larger instead. In the first game you had some combinations which were a lot more powerful than others (Steam+Steam+Death+Death+Lightning comes to mind), so hopefully it's slightly more balanced now. I loved Magicka in multi-play (is it even possible in single player without someone to franically rez you every three seconds?). I will be purchasing this. I hope it is mildly less buggy than the first. I preferred the mine laying casting pattern. It was kinda risky because it's easy to damage yourself, but boy does it kill things effectively. Hopefully it'll work on man-made machines this time. I really enjoyed how pretty the game looked though in it's own art style and magic flying everywhere, my friends and i always enjoyed it when it worked. That's what Earth x4 + Cold + AoE is for. Knock down and chill enemies, giving you time to queue up your killer combo. In fact, Water x5 + AoE then Cold x5 + AoE and you freeze all enemies solid, ripe for the gibbing. OT: Finally I have something to look forward to. I now have a picture of of Mr. Tito reading this article aloud with a Pewdiepie video playing in the background, undercutting his points.